I've created these webpages to help people look at the differences between the new NIV2011 and the NIV1984 and TNIV. John Dyer has made a similar tool which is excellent. You might also want to get hold of the text digitally from one of the following places: Amazon Kindle (Amazon US, Amazon UK), Apple iBook store, and Barnes and Noble. If you find a mistake, write about this tool (in a blog post, press release, or paper), or have a suggestion on how I could make these pages more useful then please either email me at [email protected], not because you have to let me know, but just because it's nice to know if this tool is useful to people. Please feel free to reuse any of my pages/work here as you see fit, no permission is required for reproduction (bearing in mind of course that the biblical texts themselves are separately subject to copyright restrictions). If this is of interest to you, you may also find my site comparing the NIV and NIVUK (New International Version Anglicized) of interest. The above table is a verse level comparison. 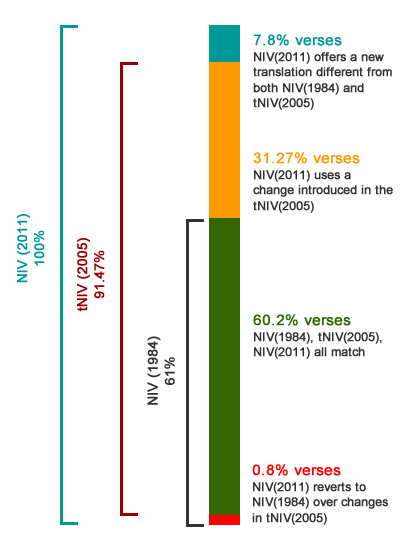 It indicates what number and percentage of verses in the NIV2011 were the same in all three translations ('No change in any'), use the NIV1984 text, use the TNIV text, or have new text not found in either earlier translation ('New text in NIV2011'). Compared to the NIV1984: 19030 verses (61.1%) are the same, and 12056 verses (38.8%) differ. Compared to the TNIV: 28595 verses (91.9%) are the same, and 2491 verses (8.0%) differ. To actually see the degree of difference between the revisions you should check where they differ, as in these statistics I mark them as being different even if only the punctuation has changed. John Dyer has produced a very helpful chart graphically showing these differences. You can also find word level comparison statistics on his comparison site. Click on the name of the book to see the details of each verse which differs within it. The best places to find out more are the NIV2011 executive summary page, the full NIV 2011 translator's notes, the Committee on Bible Translation website (and FAQs), and Biblica NIV page. The Council on Biblical Manhood and Womanhood published a summary evaluation evaluation of the gendered language in the NIV2011 as well as a comprehensive analysis published in a journal (not online anymore, cached here), both of which uses this computer analysis extensively. Christians for Biblical Equality have published a much shorter book review of the NIV2011 (which does not use this analysis). A really excellent resource to look at is the discussion with various scholars about the NIV2011 and related issues that took place on BibleGateway.com. The details of this discussion can be found on the Perspectives in Translation page. There are links to many blog posts about the NIV2011 on the Near Emmaus blog in the post NIV around the blogosphere. I would also commend to you www.bible-researcher.com, and their page on the NIV. Developed by Robert Slowley in 2010. NIV1984, TNIV, and NIV2011 text copyright by Biblica. Hebrew text from the electronic version of the Leningrad Codex maintained by the J. Alan Groves Center for Advanced Biblical Research. Scripture quotations marked SBLGNT are from the SBL Greek New Testament. Copyright © 2010 Society of Biblical Literature and Logos Bible Software.